Merry Christmas from the crew at Smiggle! Smiggle want to put a smile on your dial, with some super fantastic Smiggle Bucks for Christmas! 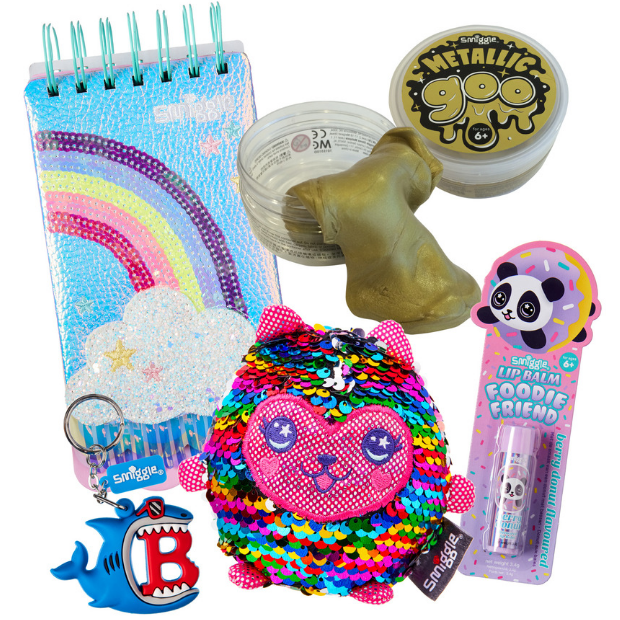 Spend your Smiggle Bucks at any Smiggle store, on any of the ahhmazing Smiggle gifts, gadgets and gizmos that you like, to the value of $50. I have 2 x $50 Smiggle Bucks vouchers to giveaway. To enter – tell me in 25 words or less what you would spend your Smiggle Bucks on and why? Competition closes midnight 15 December 2018. Full T&C’s for this competition can be found here. SmiggleBucks may not be redeemed for cash. No credit or change will be given on the unused portion of the Voucher. Smiggle is painting the town Red! Smiggle has so much to discover but I love the scented gel pens and highlighters in bright and pastel colors! Metallic gel pens. Even the shopping list looks like a work of art to keep in metallic colour! My 8 year old been asking for a backpack from Smiggles forever so that what the SmiggleBucks will go towards. With my little ones starting kindergarten next year, I’d love for them to pick out their most favourite stationery items to make their first year of school their best year of school! They are already obsessed with how unique Smiggle items are and this would give them the SPARK to the perfect start to school life! My boys love the Smiggle watches that light up – super cool Mum! My son would love the soccer ball pencil case, he’s wanted it for ages but i couldn’t justify it. So I’d opt for some back-to-school gear. To hold my kid’s favourite healthy snacks. My kids struggle with handwriting, they mirror write. Smiggle Animalia Pom Pom Pens would be fun, get them practicing and help get writing confidence back. I’d let my daughter loose in the store and guaranteed she will come back with a basket full of Goo slime. Something colourful, bright, glittery that smells delicious. Pretty much anything from the store. A trip to Westfield with my kids always includes Smiggle. Jotting thoughts, day and night! Would see her continuing to write happily! A decent backpack. We are going through 1 every 3 months – please help! My daughter has had her eye on a new Smiggle lunch bag for a while. I’d surprise her with one for the new school year. I will purchase more of Smiggle’s scented erasers. Ones I purchased at Northland Centre Smiggle when I was 5 still have a scent! A LUNCH BOX FOR MY DAUGHTER, BECAUSE ” SMIGGLE ” IS THE ONLY SECRET WEAPON TO MAKE HER FINISH HER LUNCH HAPPIEST WAY! Id get the Morrison sunglasses as my sun is uber cool and some Slime Lab Goo to keep him busy! on a very girly stationery influx. my little Angel will be happy I finally bought it. Deja Vu Owl Backpack for starters. I would love some of those gorgeous travel cups for the car. They make the best gifts and are so attractive. The Galaxy Light and the Now You See Me headphones!! Two beautiful watches from Smiggle for my two Nieces would be a perfect gift as they are getting a lot older now! Thanks Smiggle! My daughter loves unicorns, rainbow and glitter, and she loves to write and draw, so I know she would go CRAZY at Smiggle! Glitz backpack in black my niece would love this for all her violin gear. Its classy and one in a million. Smiggle youve outdone yourselves. The amazing Smiggle Advent Calendar… what a brilliant idea! Though it’s a bit late for this year, I’ll have one plenty early for Christmas 2019! All things PINK for Miss five. I’d love the Smiggle shine and glitz baseball caps. They provide perfect sun protection for kids who love the outdoors and I have four! An advent calendar because then i wouldnt have to make a decision on all they great products they have. Then again 2 minutes later!! Then again 2 minutes later!!! Then again!!.. on and on it goes. I’d get her a Hug a Buds unicorn watch. Even if she can’t read it properly I could say ” check for yourself” and she would happily go. I’d buy so much stationery with 50 bucks! As Smiggles range is deluxe! Spoiling my niece and nephew! Updating school supplies, Smiggle to the rescue! Which helps this ‘Santa’ with her present picks! Their Glitz backpack would be top of her list! As their current ones haven’t lasted the year and started to unfurl! Go Anywhere Speaker – great for the beach or other summer destinations, and Scented Gel Pens – they allow my kids to get creative, keeping boredom at bay! I’d love to buy my 3 children a Smiggle Stylin’ watch each so together they could all learn how to tell the time. I will buy two Zip It Fashion Kits for our favourite people at Aged Care so that they can keep their inner artists alive. My daughter would think it’s ace! “Smiggles” stores are what puts a beautiful; smile on my twin Great granddaughters faces, I would give it to them to use. For my 9 year old boy the “record me clock” ! And my daughter, 6 years old that “DYI unicat kit”, bedroom stuff is the best. Anything unicorn is always a good start, a mist drink bottle, a backpack or something to make art. Smiggle is too cool for school. I would take my grandson to the Carindale store and let him have the pleasure of spending $50 on whatever he likes. As a mum of two boys I would be very selfish and use it all on new glittery sequinned stationary and accessories for myself. I would give to my kids to go nuts with! They love smiggle!